Since the age of 10, I’ve had a penpal. Does anyone still use that term? Probably not…but that’s what we’ve been, Caroline and I, for all these years. Caroline was 11 when she advertised in the children’s pages of the New Zealand Women’s Weekly, looking for a penpal. Her interests, she said, were “reading, doll collecting and writing”. I was always looking for a reason to write too, and loved the idea of getting letters from the other side of the world, so I answered the girl from Scotland – later discovering I was one of many who did – and soon we were corresponding regularly. It’s a funny thing to write to someone you don’t know, but before long the letters were flying back and forth in those envelopes with airmail stripes of red and blue around the edges (or sometimes by folded ‘aerogramme’). Sometimes the envelopes also held photos, newspaper clippings and other things we wanted to share. Soon we knew each other well, on paper at least. Postcards arrived, from her family holidays in Scarborough, Blackpool and Jersey in the Channel Islands. The longest hair in Dundee! 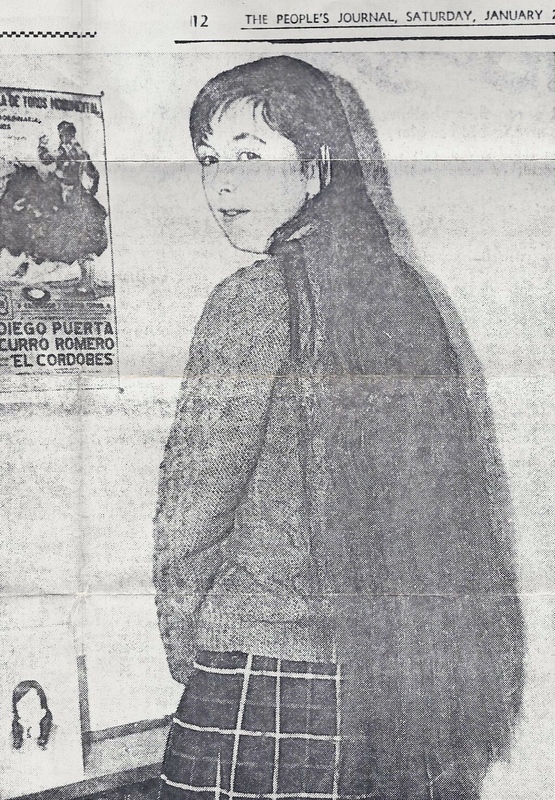 She told me about her dog, Whisky, a black Scottish terrier, and sent photos so I could see her long, long hair (once, a newspaper cutting when she was about 15 and featured for having “the longest hair in Dundee”. I can’t remember what I wrote in return, and I’m sorry now that in a cleaning-up frenzy some years ago I threw out all but that first letter and the photos. We grew up, and I took up a journalism cadetship on my local newspaper, while Caroline went to commercial college and topped the Royal Society of Arts’ typewriting awards (I’ve got the clipping for that newspaper story too!). We bought our first cars, both Minis (hers purple, mine white). When I was 20, I went to live in London on a working holiday and it wasn’t long before I was on the train to Dundee to meet Caroline in person. I was suddenly nervous; I’d committed to go for a week and was worried in case we found we didn’t actually like each other after all. I needn’t have. By this time Caroline had married Alan, and they were both delighted to show me around their hometown. 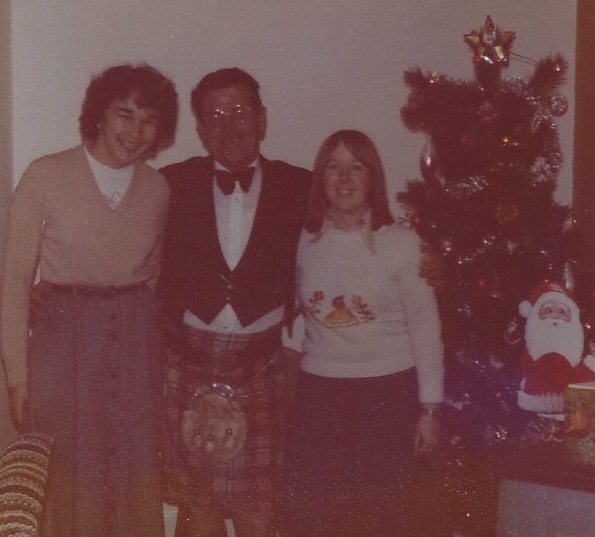 Her whole family embraced me as if they’d known me for years, with her Uncle Pat turning up on the doorstep one day in full dress kilt “to meet the wee New Zealand lassie”. I had a wonderful time, and our friendship continued as our adult lives sped up. 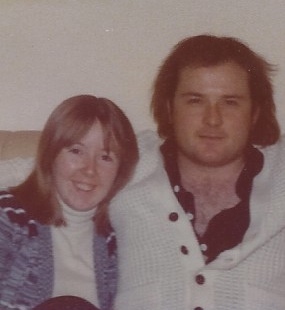 Caroline and Alan migrated to Canada, but she missed her parents Johnny and Mary – and her close extended family – too much and they returned to Dundee after a year. After weddings came children. Caroline had two sons, I had two daughters. Life brought its challenges. Caroline lost her mother after a long battle with cancer, I lost my Dad to a sudden stroke. I got divorced after 28 years of marriage, while hers to her “best friend” Alan has endured for 38 years. She and Alan have grandchildren now, a joy still a head of me (hopefully). Our correspondence has changed over the years. In the child-rearing years we were too busy for much more than the occasional letter and a Christmas card each year, but we never lost touch. In 2003, I went back to Scotland for work and managed some free time to visit Dundee and stay with Caroline and her family, meeting her grown up boys for the first time. Apart from Christmas cards, technology allowed us a quicker way of communicating and the letters were eventually replaced by emails. Since 2008, we’ve been Facebook friends, sharing much more than we could ever have done before. I’ve “seen” both her sons wedding photos and can watch their children grow up through the lens of their doting Granny. Then there are those holidays on the Costa del Sol, and more recently a video of Alan singing “Do Re Mi” as they enjoyed a Sound of Music tour in Austria. Oh, how I laughed (with you, Alan…with you). One day, I hope they’ll come to Australia so I can return their hospitality. But for now, our warm long-distance friendship continues. Do children still have pen-pals? I fear they don’t. Perhaps we travel so much these days that we simply have friends around the world that we keep in touch with, without the need to write to strangers. It may be an old-fashioned concept, but I’m glad I was one who did. Today is Caroline’s birthday and I thought it the perfect time to say “thank you” for writing back to that 10-year-old girl from the other side of the world, and for keeping our friendship going over so many years. It’s been a joy! Long may it continue. That is a lovely tale – I too had penpals but many of them moved and of course the internet has taken over. However, I agree with the joys of keeping in touch through Facebook. I see photos of people’s events and children and we can comment on each other’s joys and tragedies without ever feeling like we’ve been parted. As I live in a state other than my home state, it is a great way to feel less removed from them all and the people from overseas I’ve met on my travels too. However I do feel sad for the historians of the future – how will they ever write the biographies of our children and their children with no long letters to feature in the history – a bit like the letters written from Gallipoli from which we extract so much history. Oh yes, I am a big fan of Facebook for that very reason. Scattered families these days means we can all keep in touch so much more easily…but I agree with you about historians. How hard it will be (and I’m actually working on a project right now that is proving that to me). Thank you! I only ever had one other penpal, a girl from Romania. I got two letters from her, the second one saying that she hadn’t heard from me. I responded to them both, but sadly I think that in those days, in a Communist country, letters often didn’t make it for various reasons. I’ve still got some little trinkets she sent me in her first letter, in the envelope. Maybe I should Google her! I had so many pen pals as a girl. I can trace my wanderlust back to those letters. They came from such exotic places: Ireland, Jamaica and Germany. It was eye-opening to learn about their lives there. I wish we’d stayed in touch, but it was enough that it gave me a taste of the world to correspond with them then. Yes, I agree…it’s a hard thing to maintain. I think once you meet them (assuming it all goes well) that gives an added dimension to the friendship. We certainly don’t write letters anymore, but still keeping in touch by Facebook definitely counts in my book! That, A Glass half Full, is a heart-warming story. I had a Frech pen pal, a young man (I guess that would be ‘un jeun garçon’) who lived in Le Mans. I remember my mother asking me if I was taking my ‘French letter’ to school one day. We both cracked up at that!!! Alas, the friendship petered out, but I remember the thrill of receiving an actual hand written letter. As I sort out cupboards with renovations all around me, I have found lots of writing paper I should put to good use. Perhaps I will surprise you with a wee note, Ms Mylne….. I still love snail mail of any kind, Virginia. A postcard is always good too – doesn’t take much time, and puts a burst of colour in the mailbox! That’s a lovely story, thank you. I love Facebook too, and have reconnected with all sorts of people from the past too. But you still can’t beat the thrill of that letter in the box. I love this! It’s a practice that leads to knowing someone in a completely different way. Great that you’ve stayed connected all of these years . . Thank you! It’s a lovely friendship, and you are so right; writing to someone gives you a completely different kind of relationship. And it’s such a shame that we are losing the art of correspondence to a large degree.